It is #CakeSliceBakers time, and we are back with the August cake from World Class Cakes by Roger Pizey. In this month I chose Olive oil cake with fresh peaches to honor my country, Portugal. The Portuguese olive oil, known as ‘azeite‘, is one of the most delicious there are. If you want to know more about it, I founded this article . Here in Portugal it is very common to cook and bake with olive oil. I personally only use olive oil in my coking. Using olive oil instead of butter gives this cake a lovely light texture with a subtle flavor, as well as cutting back on it’s cholesterol contend. It´s positively healthy. In this recipe says to spread the top of the cake with apricot jam when is ready. I did it at home and I also leave here the recipe. 2– The others ingredients have to be carefully fold into the batter. We ate a slice of this cake with a small glass of wine Moscatel. This wine is made from a particularly aromatic grape variety, with citrus, flowery, ‘grapey’ flavours. It ripens to high sugar levels and is ideal for making sweet, fortified wines. These wines tend to have good, balancing acidity, floral, citrus aromas, and flavours of orange or tangerine peel, apricots and butterscotch, turning nuttier and more figgy and raisiny the longer they remain in wooden vat. Minimum time in wood is 18 months, but mostly stays a little longer, while some Moscatel of Douro is aged for 10 or 20 years, and occasional wines are bottled as ‘Colheita’, with a vintage named on the bottle. For the jam: Halve and pit apricotes. Heat de oven to 200 degrees. place sugar in a large shallow pan and put it in oven. Turn off oven and let sugar warm for about 15 minutes, stirring occasionally. Meanwhile, combine the apricots and water in a large kettle over low heat. Cook until tender, 10 to 15 minutes. Then add the warmed sugar and cooking until mixture reaches 221 degrees on a candy thermometer or falls in sheets from a spoon, about 45minutes. Remove from heat . Ladle jam into hot, sterilized jars, leaving 1/4-inch head space. Wipe excess jam from inside and outside rims, then seal. For the cake: Preheat the oven to 350ºF, and grease a deep 7inround springform cake pan. Beat together well the eggs, zest, and sugar. In a jar add the milk and olive oil, alternating add the wet ingredients with the sift flours until well combined. I did it for 3 times starting with the flour and ending up with flour again. Spoon the batter into the prepared pan and bake for 10 minutes. Carefully remove the cake from the oven and if a crust has formed make several cuts at even intervals on the surface of the cake and place the sliced peaches in the cuts. Return the cake to the oven and bake for 40 minutes. Remove from the oven, let cool for 10 minutes in the pan, and then turn out onto a wire rack. While the cake’s still warm, brush liberally with the warmed jam for a glossy finish. Serve a generous slice with a small glass oh grappa or vino santo. Here in Portugal it could be Moscatel Wine. Mais uma participação no #Cakeslicebakers com o livro World Class Cakes de Roger Pizey. Para este mês escolhi o Bolo de azeite e pêssegos frescos para dar a conhecer o nosso azeite e à “boleia” o vinho Moscatel. É um bolo fácil de fazer, com poucos ingredientes: ovos(poucos), farinha, leite e azeite. Vai ao forno com fatias de pêssego no cimo e para mim uma novidade, colocam-se já com o bolo no forno. Para o sucesso desta receita tem que se bater muito bem ovos com o açúcar, e incorporar com muito cuidado os outros ingredientes para que o bolo não perca a sua leveza que adquiriu com o bater dos ovos. Utilizei uma técnica que aprendi com a Jemma quando ela fez uma “genoise” de chocolate, que consiste em incorporar o resto dos elementos com uma colher grande. Aquelas que utilizamos para tirar a comida da panela para a travessa/pratos. Quando cozido o cimo do bolo é pincelado com doce de alperce que eu mesma fiz e deixo a receita. Acrescentei ao doce depois de pronto uma colher de sopa de uma infusão que fiz com uma mistura de ervas e frutos secos que comprei na feira de Tires numa banca chamada Ervan’area com o nome Toranja, Romã e Physalis, acentuando o sabor frutado e dando-lhe um cheiro divinal. Um bolo simples que pode ser comido ao lanche acompanhado de uma chávena de chá ou um cálice de vinho Moscatel, ficando igualmente bem com uma bola de gelado. Doce de alperce: Aquecer o forno a 200ºC. Colocar o açúcar numa tigela que possa ir ao forno. Quando o forno atingir a temperatura, desligar e pôr a tigela com o açúcar a aquecer durante 15minutos. Entretanto colocar numa panela funda os alperces e a água em lume brando e deixar amolecer a fruta +/- 15 minutos. Deitar o açúcar e deixar cozinhar até o termómetro do açúcar atingir 221ºC . O processo demora no total +/-45 minutos. Bolo: Pré aquecer o forno a 180ºC. Untar uma forma funda com ou sem fundo movível. Num jarro juntar o azeite e o leite. Numa tigela juntar as farinhas peneiradas. Na tigela da batedeira com a ponta de varas, na velocidade máxima bater os ovos com o açúcar e as raspas de laranja durante 5 minutos até a mistura dobrar o volume e ficar com uma cor “pálida”. Retirar a tigela da batedeira polvilhar a mistura de ovo com 1/2 da farinha e com uma colher de sopa grande incorporar com movimentos grandes debaixo para cima. Deixar a colher na mistura e verter o azeite com o leite pelas costas da colher como vê na figura e novamente com os mesmos movimentos incorporar na massa. Finalmente o resto da farinha. Esta técnica ajuda a massa a não perder muito volume e o bolo quando cozido ficar “fofinho”. Verter a massa para a forma e levar ao forno 15 minutos. Ao fim desse tempo abrir a porta do forno retirar o bolo e se este já tiver uma crosta, com uma faca fazer oito cortes com intervalos regulares para colocar as fatias de pêssegos e voltá-lo a meter dentro do forno cerca de 45 minutos ou até o palito quando espetado no bolo sair seco. Eu fiz este processo todo com o bolo na porta do forno com cuidado para não me queimar. Na verdade não quis arriscar tirar o bolo completamente do forno como indica a receita. Retirar o bolo do forno, deixar arrefecer dentro da forma durante 10 minutos e ao fim desse tempo então retirar da forma. Com o bolo morno pincelar o cimo com o doce de alperce que também deverá estar morno. Deixar arrefecer por completo e servir. 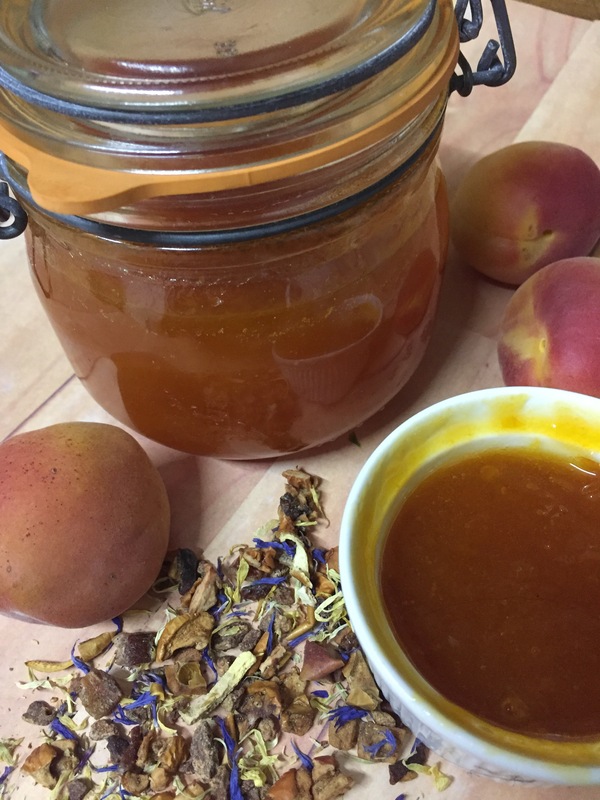 Homemade apricot jam?! Now that’s dedication! Lovely presentation! I used homemade apricot jam on my cake too… because I happened to have it. My cake was too dry but maybe a glass of your delicious wine would have helped! Thank you for the two tips! Gorgeous color from your homemade jam! Big Yumms! Your cake bakes up lovely! And gorgeous jams! Ana your cake looks fantastic and I love that you used homemade jam. A glass or two of Moscatel wine is the perfect accompaniment.